Lexa Woods is Hollywood's most talked about Actress. "Talked about" meaning the actress with the most headlines about her. Lexa has been in the movie/television industry since she was 4 years old. Currently she is a 16 year old actress with a reputation as Hollywood's bad boy, player and downright diva. When her step-mother/manager Indra sends Lexa back to high school, Lexa is forced to change her ways and fix her attitude. But will she be able to do it? _______________ Clarke Griffin is a 16 year old junior at Polis High School with a mind set towards studying, earning her high school diploma and setting off to college to join the medical field, just as her parents did. Clarke is not fond of the Hollywood gossip and drama, unlike the rest of her school is. So when the one actress she hates the most decides she is returning to high school, Clarke is not too thrilled about the idea. 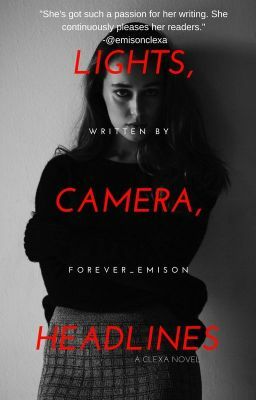 ________________ Read to find out how to two girls from opposite sides of the camera meet in my new and FIRST Clexa based story "Lights, Camera, Headlines"!